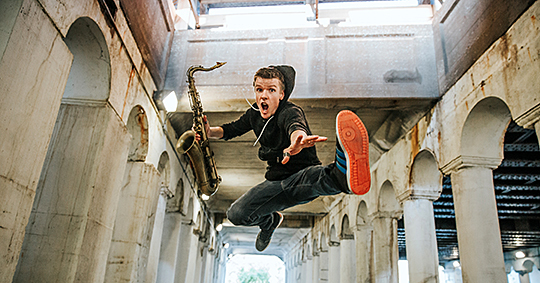 Beatbox saxophone artist Derek Brown will visit The University of Toledo this week. He will perform a free concert Thursday, Oct. 4, at 7 p.m. Brown also will present a master class for UT students earlier in the day at 2 p.m. Both events will be held in the Center for Performing Arts. Brown’s playing style is unique. He achieves a one-man band effect by utilizing not only the saxophone, but different vocal techniques such as slap tonguing, circular breathing, and coordinated vocals to create his own sound. Brown’s music has made a national impact, and he has amassed an impressive fan base. He has been viewed at least 30 million times on various social media platforms. He is on a tour of college campuses across the country known as the FiftyFifty Tour, with of at least one performance date in each of the 50 states over the course of nine months (August 2018 through May 2019). The UT performance is one of just three scheduled for the state of Ohio. Tour information is available at fiftyfiftytour.com. He earned a bachelor of music degree in musical performance from Hope College and a master of music degree in jazz studies from the University of Cincinnati’s College Conservatory of Music. More information about Brown, who served as director of jazz studies at Abilene Christian University, can be found at derekbrownsax.com. This entry was posted on Tuesday, October 2nd, 2018 at 3:37 am and is filed under Arts, Arts and Letters, Events, UToday .